My home is always stocked with a few key items that I always have laying around because I know that they will always come in handy. One of the items on top of my "key items list" is baking soda. 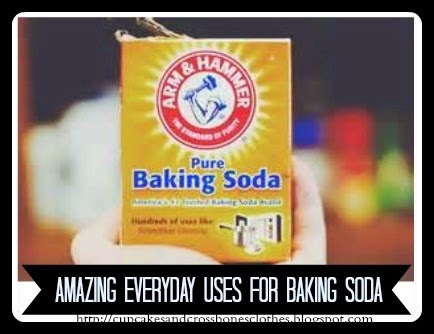 The uses of baking soda are endless, and it is cheap! From health to cooking and cleaning, this item comes in handy on numerous occasions. Here are a few tips and tricks on how you can use baking soda as a staple product in your home. -Use it to clean and whiten teeth by mixing it into a paste with peroxide and brush it on your teeth, then rinse. -Use it to wash away blemishes, fines lines, and have glowing skin by mixing it into a paste with some water and gently rubbing it in a circular motion (avoiding eyes) on your face. Leave it on for about 5 minutes and wash it off with warm water for incredibly smooth skin. -Finished chopping onions or garlic and can't get rid of the odor on your hands? Rub some baking soda and warm water between your hands to get rid of the stink! -Freshen your breath by mixing 1/2 teaspoon of baking soda mixed with some water and gargle your way to a fresh mouth. -Put an open box of baking soda in your fridge to prevent smelly odors. -Add a teaspoon of baking soda to water in your vase to keep flowers fresher longer. -By sprinkling some baking soda in your gym sneakers or boots, you can remove odors and have fresh kicks again. -Soak your dish rags and even sponges in a bowl of water and baking soda to get rid of that musky smell. -Sprinkle some on your rug to remove odors. Let the baking soda sit for a minute and vacuum it up. This also gets rid of vacuum odors too. -Put baking soda and a few drops of essential oils in a jar with holes in the lid to keep a room or closet smelling fresh. -Did you know that baking soda sweetens the tomatoes in your garden when you sprinkle it on the dirt around your plants? -Cleaning the toilet? Add 1 cup of baking soda to your toilet, use a toilet brush and scrub it all around. Let it sit for an hour and flush. Sparkly stink free toilet! -Remove stains from pots and pans by working it into a paste with water, scrub, let it sit for a 10-15 minutes and wipe your pots and pans clean. -Get that gross garbage smell out of your garbage can by scrubbing down the inside with some baking soda and water, then hit it with the hose outside. - Rinse baking soda down the drains of your home with warm water to keep them odorless. Are you a fan of baking soda? What are other uses for baking soda that you have discovered? That is such a fantastic idea! I would def love to try that out one day. i freaking love baking soda... gets my bathroom and stove cleaned every time! and its a must in the fridge. gah blogger keeps eating my comments. i love baking soda! its a must in the fridge and i use it for cleaning all the time, bathroom & stove especially! I know, right?! It's so perfect for getting any grease splatters off the stove for sure! haha, thanks girl! It is so inexpensive and you can use it in so many ways, how can you lose?! Okay I seriously did not know about 75% of these. I've always just kept some around for baking and in my fridge, ha! Definitely trying it to whiten my teeth.. can you see a noticeable difference? Glad I could shed some light on baking soda for you! haha. Baking soda crystals are softer than enamel and dentine which are your tooth's outer layers, therefore can mechanically scrub off stains without scratching those parts of your smile leaving you with a pearly white smile. Great tips! I had no idea baking soda could do all this. I use it for baking and for keeping the funky smells out of my fridge, but that's it. I'm totally going to try some of these! Hey Dana! Thanks! If you try anything you have to try making it into the paste with water and use it on your face. I swear by this. It reduces any signs of breakouts and makes my skin so smooth and even. What great tips! I sprinkled some in the cat litter when it smelled and I didn't have time to get a new box. Worked perfectly! I've heard it works wonders for litter boxes. Great tip! I always keep some in the fridge. I haven't thought to use it for sponge cleaning. Great tips! OH its a must for the fridge!